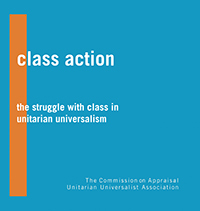 In a time of vast and growing social and economic inequality, the 2017 Commission on Appraisal examines the impact of class and classism on Unitarian Universalism—its association, congregations, members, and friends. Classism thwarts Unitarian Universalism’s vital work of building community and giving life the shape of justice. With its in-depth analysis of our faith’s history, theologies, and current structures and its final recommendations and resources for future work, Class Action is a must-read for all looking to live more fully into the faith and vision of Unitarian Universalism. The Commission on Appraisal was inaugurated by the bylaws of the Unitarian Universalist Association in 1961. The Commission is charged to review, study, and report on any function or activity of the Association that would benefit from an independent review, and to report the results at least once every four years to the General Assembly. Ask a roomful of people to define class and you’ll get a different answer from every one of them. Class is that often referred-to, amorphous, complex, ever-present ordering of social roles, culture, power, and access which governs our relationships and interactions with each other and with our other social institutions. Why study class in Unitarian Universalism? And if that foregoing sentence is any indication of what it’s like to do so, why study class at all? We live in a time of vast and growing inequality. Our major institutions are carrying the facade of democracy less and less; it is clear to many that we are living in a plutocracy instead. We find it of vital importance to examine the structural and cultural makeup of class, for it surely is at play in nearly every facet of our lives—including our lives and communities of faith. The system of class has very real, material effects on us all. As we are a people that seek justice, equity, sustainability, and peace, we must examine those structures that are deleterious to our efforts. Class is certainly that. If the prophetic and vibrant messages of Unitarian Universalism are to be incarnated in the world, we must address it.